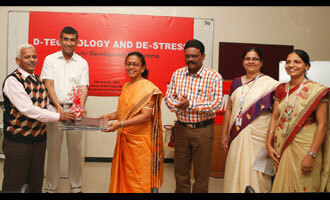 MET Institute of Pharmacy (Diploma) successfully conducted Faculty Development Programme on ‘D-Technology and De-stress’. The programme was inaugurated by lighting of the ceremonial lamp by Dr. U. B. Hadkar, Director, MET IOP, Dr S. D. Bhosale, Principal, IOP (Diploma), Ms Ritu Uppal, HOD, MET CET and Ms Abhilasha Sharma, FDP Co-ordinator.